Hawthorne, California—If the 2015 Tesla Model S P85D is just some kind of harmless EV, how come we’re accelerating so hard that the blood is pooling up in the back of our brain and this tunnel ahead of us is glowing as if we have some kind of lightspeed thing going on? Oh, that’s right, the new twin-engine, all-wheel-drive P85D is brought to us by the same people who build the Space X rocket. On a warm night in October, Elon Musk walked out onto a stage just a few hundred yards from his Space X rocket factory to face a cheering crowd of enthusiasts who had been invited to see the unveiling of his latest, greatest thing. And like the late Steve Jobs of Apple (if Jobs had been a rocket scientist), Musk brought forth a product that doubles down on technology—double the engines, double the driving wheels, and double the driving safety. And along the way, Elon Musk also showed us that Tesla is a much more than a company that builds EVs. As a quick ride around a little test loop at the Hawthorne facility proved to us, the 2015 Tesla Model S P85D is the kind of car that the German car companies would understand. It has more of everything, and the result is a quicker, faster car that will be more fun for speed enthusiasts to drive. And yet the impulse that drives the performance is simple practicality. Even at its impressive sales volume of approximately 35,000 cars per year, the rear-wheel-drive Tesla Model S has been leaving potential owners in wintery climes out in the cold. All-wheel-drive is the natural solution, just as it has been for BMW, Cadillac, Infiniti, Jaguar, Lexus and Mercedes-Benz. But unlike conventional car companies that must develop complex mechanical systems to ensure that the front and rear wheels work together in their luxury cars, Tesla has been able to adopt the simple expedient of dropping another motor into the Model S to power the front wheels. 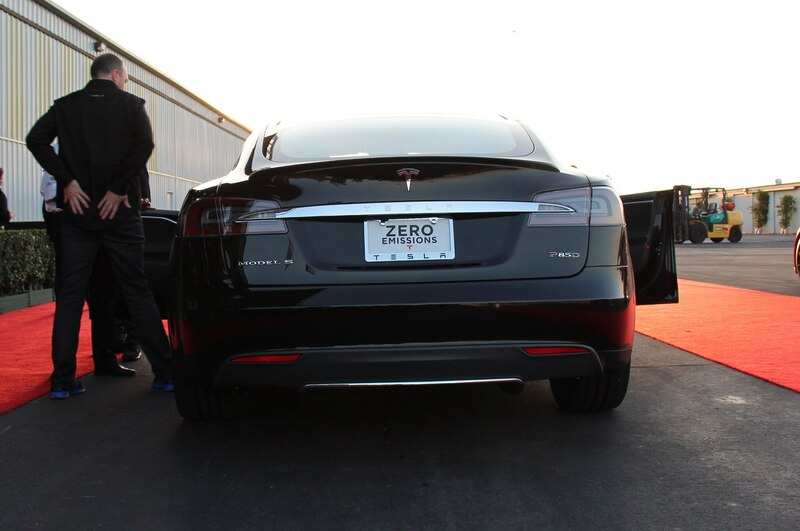 At the rear of the Model S platform (which carries the car’s battery pack), a motor powers the rear wheels. For the new D-type variant of the 2015 Tesla Model S, another motor has been adapted to the front of the platform to power the front wheels. This technology—Dual Motor All Wheel Drive—will be available for each of the current Model S variations, which are distinguished by battery capacity: the 60-kWH 60D and the 85-kWh 85D. Meanwhile, all-wheel-drive technology also goes into the car that replaces the current 85-kWh P85 Plus and becomes the P85D. 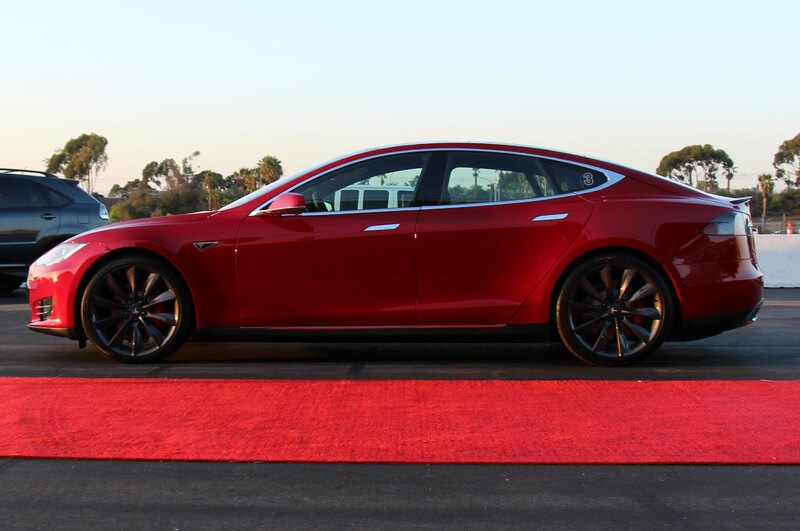 For the 2015 Tesla Model S 60D, the replacement of one, large-capacity motor with two medium-capacity ones adds 176 lbs to the basic Model S. Both the front and rear motors are each rated at 188 hp and 181 lb-ft of torque. The result is a car that is 0.2 seconds quicker to 60 mph (5.7 sec) and the quarter-mile (14.0 sec) on the way to a top speed of 120 mph. For the 2015 Tesla Model S 85D, the replacement of the one, large-capacity motor with two medium ones once again adds 176 lbs to the car. Like the 60D, the 85D’s motors are rated at 188 hp and 181 lb-ft, but the car’s larger battery power results in a car that is 0.2 seconds quicker to 60 mph (5.2 sec) and the quarter-mile (13.5 sec) on the way to an electronically limited 155 mph. Musk tells us that the combination of two medium capacity motors is more powerful than a single large one because the two can each run at an optimum rpm depending on the circumstances, and the result is useful power that is more than a single motor can provide. Moreover, the efficiency of these motors plus the added benefit of more energy regeneration under braking adds ten miles of cruising range, so the 60D is rated at 215 miles and the 85D is rated at 285 miles (versus 208 miles for the rear-wheel-drive 60 and 265 miles for the 85 and P85). The 2015 Tesla Model S P85D is the new flagship of the Tesla line, and it looks the part now that it’s all dressed up with things like red brake calipers. Like all 2015 versions of the Model S, the P-model gets slightly cushier seats that feel far more comfortable. More important, the P-model gets a couple of big motors, which is kind of what you expect from a company that builds rockets. The 2015 P85D has a rear motor that is rated at 470 hp and 443 lb-ft (just like the discontinued, rear-wheel-drive P85 Plus), but it also carries a front motor rated at 221 hp and 224 lb-ft. The result is a car that weighs 291 lbs more, yet gets to 60 mph in 3.2 seconds versus 4.2 seconds, finds the end of the quarter-mile in 11.8 seconds versus 12.6 seconds, and is electronically limited to a speed of 155 mph. Cruising range declines by 10 miles over the former P85 Plus, to 275 miles on a full charge. 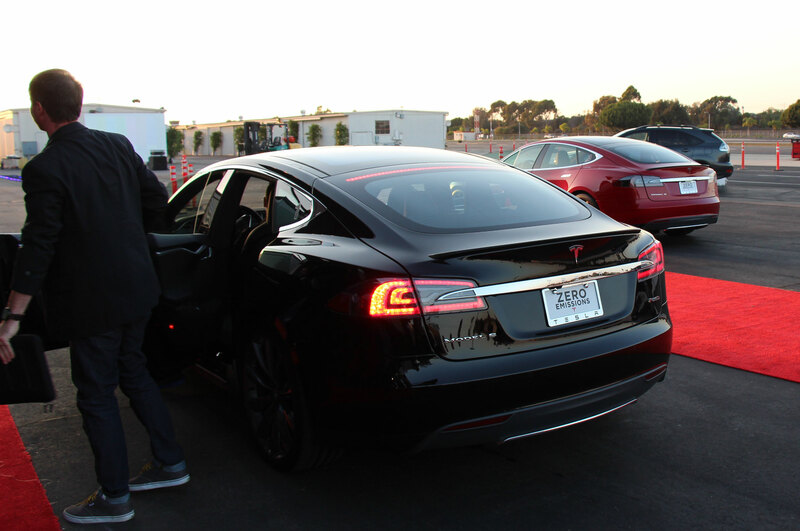 The 2015 Tesla P85D should be not only fast (1.0 g in acceleration, we’re promised) but also great to drive. Tesla’s test drivers tell us the suspension is a little more taut, so the chassis is livelier and more responsive despite its long, long 116.5-inch wheelbase. A 50 percent front/50 percent rear weight distribution for the car’s hefty 4,936 lbs also helps, plus we’re told that car steers with a quicker, more athletic feel. All-wheel drive is also part of the 2015 P85D’s dynamic assets, and we don’t mean for just rain and snow. Electronic controls and electronic power work together to deliver the ability to distribute power fore and aft and side to side with both speed and subtlety. This means the car has the ability to give you the right kind of traction to keep the car safely stable at great speed or when the surface is suddenly slipperier under the right-side tires than the left-side ones. And then the drive torque also can be proportioned to each corner to the car to improve handling for performance. Much to our surprise, Tesla has made great strides in adapting the 2015 Model S to the new world of active safety. Every car coming down the Tesla assembly line now carries an array of sensors mounted in the bumpers fore and aft, forward-looking radar, an image-recognition camera, and 360-degree sonar, plus connectivity to real-time traffic information. As a result, the car has adaptive cruise control with automated braking, the ability to read speed limit signs and adjust vehicle speed appropriately, lane departure warning and the ability to track within a lane without the driver’s hands on the wheel, hazard avoidance, the ability to change lanes automatically (based on both sensors and real-time traffic information), and naturally the ability to park itself. The steering will even resist any movement that the car believes will result in a collision with a fixed or moving object. What is impressive here is not only the technology in the Auto Pilot system but also the apparent success that Tesla has had in negotiating the minefield of liability law that surrounds the concept of autonomous driving. We’ll see just how good the Tesla system is soon enough, yet it’s more impressive that the company is already a player in this technology. 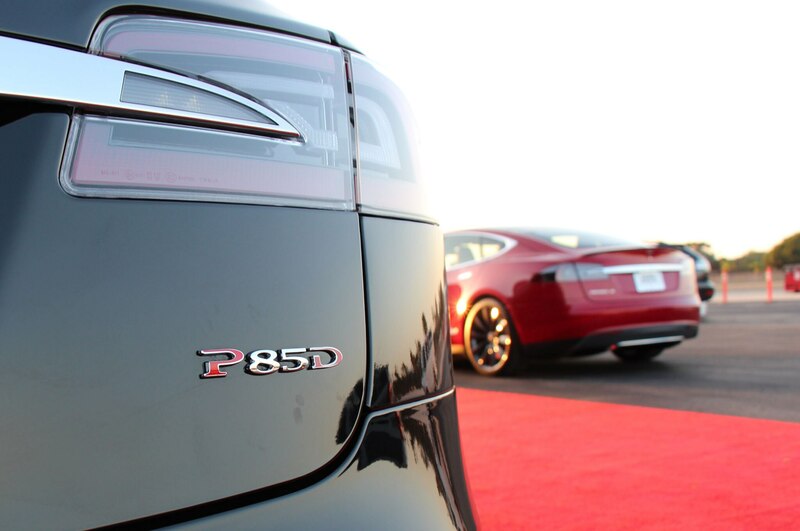 Pricing has not been announced, but the 2015 Tesla Model S 85D will be in Tesla stores in December, while the 2015 Tesla Model S 60D and 2015 Tesla Model S P85D will find their way there in February. Meanwhile, work continues on the forthcoming Model X sport-utility, which will feature this new all-wheel drive platform. In the beginning, Tesla’s Elon Musk seemed as if his automotive ambitions were circumscribed by electric power. Yet we forget that Musk drove a McLaren F1 to the very first showing of the Tesla Roadster at Barker Hanger in Santa Monica, California, back in 2006, and as he has struggled to build the company’s cars and make them reliable since then, he seems to have acquired a deeper understanding of things automotive. And the values that he now expresses are those that car enthusiasts can easily embrace.